The above Conquering Knife or Meed Moh made and blessed by LP Kant(read "Gun") of Wat Kao Kaew, NakonSawan province, in B.E.2509. LP Kant was a close disciple of LP Doem, Wat NongPho. He learned so much from his Guru and finished Meed Moh creation including ivory tusk carving amulet. It's widely known that in among LP Doem's disciple lineage, he was the top one who could make efficacious Meed Moh only second to his Guru--LP Doem. LP Kant's Meeh Moh can be used as a substitution for LP Doem's, and is also so powerful as same as his Guru's. But LP Kant's costs around 4-5 times cheaper than LP Doem's. Anyone who was stabbed by such the knife, the wound can not be cured by any modern medical. LP Kant passed away in B.E.2513 at the age of 76, after living in the monkhood for 54 years. There is an important Katha to chant for enhancing its efficacies before bringing along or using LP Kant's knife, it's the same Katha as of LP Doem's knife. 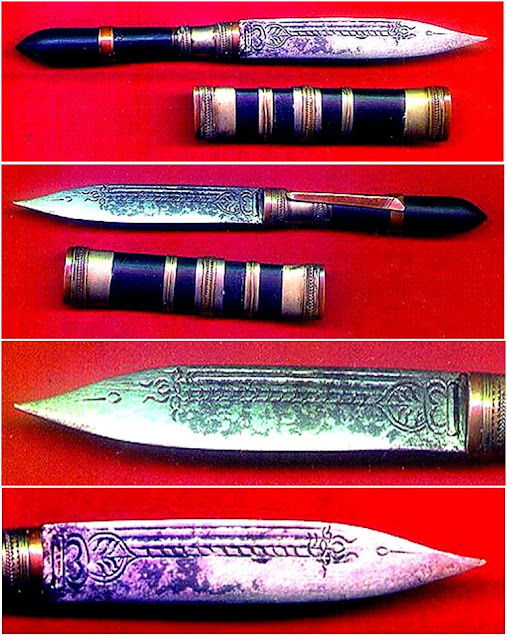 The Katha requests for 5 unconquerable weapons embedding in the knife: God Indra's Wachiravuth, God Wessuwan's baton, demon Alawaka's apocalyptic red cloth, God of the death Jamaraj's eyes, and Naraiyana's chakra.